Click the links below to jump straight to our Computex 2018 coverage. Computex 2018, biggest computing show of the year, is drawing to a close, but there's still plenty of news to report and reviews to file. 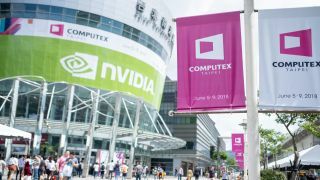 Computex 2018, runs from June 5 until June 9, and features companies such as AMD, Intel, Nvidia and Asus. We are also there, reporting on the latest news from the show floor. We’ll also be bringing you hands-on reviews of the top technology that’s on show, including cutting-edge laptops, stunning monitors and more peripherals than you can shake a joystick at. Well that's a wrap for Computex 2018, it's been an eventful show to say the least. Intel and AMD reignited the CPU war, MSI announced an incredibly value-oriented gaming laptop, the Asus ROG Phone is the gaming smartphone we never knew we needed and that's a mere fraction of the cool new products announced at the show. PC components are cool and all, but our real love of PC gaming comes from all the cool accessories the hobby generates. From VR backpack PCs to ultra-thin keyboards and ultra-wide gaming monitors, here were our top picks for the Best gaming gear from Computex 2018. The world’s biggest computer show wouldn’t be complete with some new PC cases, after all no desktop is complete with a fancy enclosure. On top of everything getting a splash of RGB, we saw budget cases get better than ever and just about everyone had an improved implementation of tempered glass side panels. Click through to see the Coolest PC cases of Computex 2018 including one of the first dual-system ATX chassis. The CPU war has officially gone nuclear with Intel announcing a 28-core processor bound for later this year and AMD firing back with its own 32-core CPUs. Beyond insane core count processors, there were plenty of other little tidbits between memory featuring more RGB, faster SSDs from everyone,and surprisingly, a 'new' graphics card from AMD. Here are the Best components of Computex 2018. During our time at Computex 2018, we've seen a huge range of amazing laptop devices, proving that there's still plenty of life left in the form factor. So, to celebrate the laptop renaissance, we've picked out the best laptops of Computex 2018. While we're at Computex 2018, we'll be getting time to test out some of the most exciting tech that's been shown off. Here you'll find our hands-on reviews of the best kit. We've given the EVGA SC15 a quick spin at Computex 2018, playing a few rounds of PUBG, and so far, we're impressed. It comes with some pretty great components and a lovely 144Hz display. Sadly, we don't know how much it will cost, though. The Asus ZenBook Pro 15 certainly grabbed our attention at Computex 2018 with its use of a 'ScreenPad' touchscreen in place of a mouse pad, but how does the rest of the laptop fare? Check out our hands-on review for our initial thoughts on Asus' new ultrabook. We've spent some time with Asus' new mid-range gaming laptop at Computex 2018 as well, and while the Asus ROG Strix Scar II doesn't feature a huge amount of upgrades over the previous generation, there's still plenty to like. The Zotac VR Go 2.0 is a portable battery-powered PC that you wear as a backpack, the aim being that you can play virtual reality games without being tethered by wires. The new VR Go 2.0 ups the processing power of the PC, but it cuts the battery life in a bid to make it lighter. Is it a worthwhile trade? MSI has set out to make thin and light gaming laptops more affordable for mainstream consumers, and its first attempt, the MSI GF63, has been unveiled at Computex 2018. It comes with an ultra-slim design and powerful components. Asus continues to impress us at Computex 2018, this time with the Asus ROG Strix Hero II, a very nicely designed affordable gaming laptop that proves a low price doesn't mean you have to make compromises when it comes to power and looks. With an Intel Core i7-8750H, GTX 1060 6GB, Full HD 144Hz display 16GB 2666Mhz RAM, 256GB PCIe SSD and a 1TB FireCuda SSHD, it's a very nice performer when it comes to games. We've got our hands on the Asus ZenBook S, which is another awesome Ultrabook from Asus, a company which seems to have really nailed the form factor. This 13-inch laptop has a gorgeous design and a pretty reasonable price tag to boot! The Asus ZenBook Pro 15 has been shown off at Computex 2018, and it's certainly impressed us. Not only does it have an Intel Core i9 processor and Nvidia GTX 1050 Ti graphics card, but it also has a 5.5-inch screenpad just below the keyboard, where the mouse pad usually is. Check out our hands-on video above to find out what we think of this innovative design. Roccat brought its gorgeously-designed gaming keyboard, the Roccat Vulcan 120 AIMO, and we've had some time to test it out. Did we like it? Check out our review to find out (spoiler alert: yes we did. A lot). The Asus VivoBook S15 and VivoBook S14 are at Computex 2018, and these colorful laptops are aimed at catching the eye of mainstream consumers. They come in Firmament Green, Star Grey, Silver Blue, Gun Metal, and Icicle Gold colors, and feature Asus' new ErgoLift hinge, which lifts the back of the laptop up when opened, making it more comfortable to type on. Asus has surprised us all by announcing its own gaming-focused smartphone at Computex 2018. With a gorgeous AMOLED screen 6-inch screen and powerful specifications, this is one hell of a smartphone, so make sure you check out our Asus ROG Phone hands-on review. If you want to see it in action, then we've also got a video review where we look at the handset in detail. You'll find all the latest news from Computex 2018 here. We're at the event, so make sure you check back here regularly to keep up with all the coolest tech and important announcements. Intel's reveal of its 28-core processor at Computex 2018 certainly got our attention, and now it's revealed more information about the CPU. A demo unit has been running, and it requires a large cooling solution and powerful PSU. Intel only just revealed its beefy Core i7-8086K back at the start of the week at Computex 2018, yet the anniversary edition processor has already been overclocked by an expert to hit a speed of 7.24GHz across all six of its cores. It's certainly a promising hint at what this new CPU will be capable of. Be Quiet, the company behind gaming peripherals and coolers that aim to run as silently as possible, has shown off two new PC cases, alongside other devices, such as a cooler for the AMD Threadripper CPU. MSI has been very busy at Computex 2018, and it's shown off a huge range of new gaming devices, from slimline gaming laptops, to super ultra-wide monitors and powerful graphics cards. We've been loving Huawei's laptops, and it has announced a new MateBook D at Computex, which aims to win over MacBook fans thanks to a gorgeous design and powerful components. At Computex 2018, Intel has claimed it has found out a way to increase laptop battery life to 28 hours. It has collaboratively engineered Low Power Display Technology, which is featured in a 1W panel produced by Sharp and Innolux, which can literally cut LCD power consumption levels in half. AMD has finally maed its Ryzen Threadripper 2nd-generation processors official, with it's highest-end CPU offering 32 cores and 64 threads - a huge leap over last generation's 16 cores and 32 threads. AMD also showed off its vision of the future of its Radeon RX Vega graphics cards at Computex 2018. Packing 32GB of HBM2 video memory, and a miniaturized process that brings a 35% performance boost over last-generation, we're very excited to find out more about these 7nm Radeon GPUs. We're big fans of Razer's self-made and designed keyboard switches and now you'll soon see them on keyboards not made by Razer itself. The gaming hardware maker announced it will be bringing its Green, Orange and Yellow mechanical switches to third-party keyboards soon. Additionally, Razer is about to make synchronizing the RGB lighting between your all your peripherals and PC components less of a chore. At Computex 2018, the company also announced a new partnership with MSI, NZXT, AMD, Thermaltake, Lian Li, Vertagear, and Ducky. The Razer Chroma Connected Devices Program will allow more RGB lighting-enabled devices, such as the Vertagear RGB gaming chair we saw at CES 2018, to work with Chroma. Intel Optane Memory came to laptops a few months back, but only now are we seeing it introduced in a gaming laptop for the 'first time.' Gigabyte proudly smashed that record by introducing a refreshed line of Sabre gaming laptop equipped with the said storage speed-boosting memory, faster 120Hz screens, and of course, Intel Coffee Lake processors. Asus has been very busy at Computex 2018, and it's revealed an incredibly innovative new laptop, which is currently known as Project Precog. With a second screen that acts like a smart keyboard, and which can also show apps and videos, and powered by artificial intelligence, Project Precog is shaping up to be a very exciting device, which Asus hopes to release in 2019. One of the most exciting announcements at Computex 2018 is the new that Intel is set to launch a 28-core processor that's clocked at 5GHz. That would certainly lead to incredible performance, but it will probably be accompanied by an incredible price tag as well. Intel also finally confirmed its Core i7-8086K processor, which hits 5GHz without overclocking, making it the most powerful Coffee Lake desktop processor to date. Asus has announced an all-new type of Ultrabook laptop known as the Asus ZenBook S, or UX391 at Computex 2018. Like the VivoBook S laptops it's also shown in Taipei, the ZenBook S comes with an ErgoLift Hinge to angle the keyboard to make typing on it more comfortable. It's got a 13.3-inch touchscreen with ultra-thin, 5.9mm bezels and a resolution of either 1,920 x 1,080 or 3,840 x 2,160. Asus’s Tru2Life video technology enhances either screen’s contrast, sharpness and playback smoothness through pixel analysis. Powering that display is an Intel 8th generation Core processor – your pick of the Core i5-8250U or Core i7-8550U – with Intel HD Graphics 620. Backing up that chip is up to 16GB of DDR3 memory at 2,133MHz and as much as 1TB of PCIe SSD storage. Computex 2018 is quickly becoming the event where Qualcomm announces its new chipset for Windows 10 devices. This year the company rolled out its second generation Snapdragon 850 processor designed to improve the performance, longevity and wireless connectivity of Always Connected PCs. If you really want your gaming rig to stand out, then you'll love Corsair's new Vengeance RGB PRO RAM, which has been announced at Computex 2018. These RAM sticks get a light bar to run across the top, with 10 individual LEDs on each stick of RAM, so you can now display a flowing spectrum of which can customised through Corsair’s new iCUE software. Corsair’s new Vengeance RGB PRO series is engineered to perform hitting a top speed of 4,600MHz without overclocking. And, if users want to push their RAM even father, users can tweak the XMP 2.0 profile with ease through a single motherboard setting. Asus has announced its new gaming-focused smartphone at Computex 2018, with the ROG Phone set to be an amazing hand-held gaming device... which also makes phone calls. It's billed as the first smartphone in the world to run with a 3D vapor-chamber cooling system, and it is powered by a Qualcomm Snapdragon 845 octa-core chip with the clock speed pushed up to 2.96GHz. It also features a 6-inch AMOLED screen with HDR support and 90Hz refresh rate. Asus has announced that refreshed versions of its 15-inch ROG Strix Scar Editon and ROG Strix Hero Edition gaming laptops will now feature nearly bezel-less screens. On top of slimming down the machines, Asus has also granted both of its eSports-focused machines new 1080p IPS panels rated with a 144Hz refresh rate and 3ms response time. Asus has announced several new monitors at Computex 2018, including the 4K Asus CG32UQ, which has been specifically targeted at console gamers. It's got a 31.5-inch screen, Adaptive Sync and supports HDR10, which Asus plans to make it a great screen for PS4 Pro and Xbox One X owners. It also features Halo Sync lighting for more immersive gaming. Asus also announced the Asus VG49V, which comes with an incredibly wide 32:9 aspect ratio, 49-inch screen size and 144hz refresh rates. Its resolution is 3840 x 1080, and the screen is curved to make using this ultra-wide aspect ratio more comfortable. Finally, Asus also revealed the Asus ProArt PA34V, a monitor that's been carefully calibrated for creative professionals. Computex isn't just about consumer computing devices, as Nvidia showed when it announced its Jetson Xavier, which it claims is the single biggest robotics project Nvidia has worked on, and its first computer designed specifically for robotics. Nvidia also announced the Isaac platform, which will power a new generation of autonomous machines. Acer has announced AMD processor and graphics options for its entire, freshly-revealed PC gaming hardware lineup. This includes the Acer Predator Helios 500, a 17.3-inch laptop with 2nd generation AMD Ryzen processors and a Radeon RX Vega 56 GPU. Acer also unveiled its desktop gaming PCs, including the Predator Orion 5000, which will come with a choice of AMD hardware as well.